Background: Intestinal parasites seem to be an important public health problem, especially in developing countries as the prevailing climates are suitable for their spread. Aims: This study was conducted to determine the prevalence of enteric parasitic infection amongst masons in Benin City, Edo State. Settings and Design: A total of 120 cement masons in building construction sites in the metropolis and suburbs in Benin City were recruited in this study. Materials and Methods: Faecal specimens were collected from each participant, and intestinal parasites were detected using microscopy. Statistical Analysis: The frequency data were analysed using Chi-square (χ2) while the risk factors were calculated using odds ratio. Results: A prevalence of 30.8% of intestinal parasitic infection was observed amongst masons in Benin City. Length of years of work significant affected the prevalence of intestinal parasitic infection amongst masons. Ascaris lumbricoides, Strongyloides stercoralis, Trichuris trichiura, hookworm and Entamoeba histolytica were the intestinal parasites recovered, and A. lumbricoides was the most prevalent of all the intestinal parasites recovered amongst masons. Conclusions: Measures to reduce the prevalence of intestinal parasitic infections amongst masons are advocated. Intestinal parasites seem to be an important public health problem, especially in developing countries as the prevailing climate is suitable for their spread., These parasitic infections are amongst the most common infections worldwide and are caused by helminths and protozoans. In Sub-Saharan Africa, it is estimated that approximately 25% of the total population is infected with one or more of all intestinal parasites. Intestinal parasitic infections are endemic worldwide and have been described as the major cause of illness and diseases. These parasites can cause diseases in humans, in which the burden of these diseases often depends on communities in the tropics and subtropics. Millions of disability-adjusted life years are lost yearly as a result of which, they represent a persistent burden on social and economic development. The most common soil-transmitted helminths are Ascaris lumbricoides, Trichuris trichiura and the hookworms, with an estimated 5.3 billion people worldwide, out of which A. lumbricoides and Ancylostoma duodenale are estimated to infect more than a billion with a high number of people in Sub-Saharan Africa.,Giardia intestinalis is the most prevalent protozoan worldwide with about 200 million people infected annually.Entamoeba histolytica is estimated to infect 40–50 million people out of which 100,000 deaths are recorded yearly. The majority of infections are associated with conditions such as reduced access to safe drinking water, adequate sanitation, personal and community hygiene, poverty, inadequate access to healthcare, prevailing climatic and environmental conditions. These conditions lay the stage for continuous transmission of intestinal parasitic infections. The prevalence of these parasites varies from one population to another and both between and within countries. Masons are those that work with stone or brick in building a house. They frequently come in contact with the infective forms of these parasites in contaminated sand in the course of using sand for mortaring. Masons are more likely to have poor personal hygiene standards that may result in pathogenic infections. Masons are predisposed to these geohelminths as they regularly come in contact with soil contaminated with the infective stage of these parasites in the course of their duty. Information is lacking on the prevalence of enteric parasitic infection amongst cement masons in Benin City, Edo State. Thus, this study aimed at determining the prevalence of enteric parasitic infection amongst masons in Benin City, Edo State. This study was conducted at various building construction sites in Benin City and environs. A total of 120 cement masons in building construction sites in the metropolis and suburbs in Benin City were recruited by random sampling. Participants that recently concluded a course of antihelminthic drug as well as participants that refused consent were excluded from this study. A well-structured questionnaire bothering on the sociodemographic characteristics was administered to each participant. Informed consent was sought from each participant before the collection of specimen. The protocol for this study was approved by the Ethics and Research Committee of the Ministry of Health, Benin City, Edo State. Faecal specimens were collected from each participant into clean, transparent and well-labelled universal container. The stool specimens were macroscopically examined for consistency, colour, presence of blood and mucus, presence of segment or adult intestinal parasites. Freshly produced stool samples were processed using a previously described method. About 1 g of faeces was emulsified in 4 ml of 10% formol-saline. The mixture was sieved through a funnel layered with gauze into a test tube. To the filtrate, 4 ml of diethyl ether was added, mixed and centrifuged at 3000 rpm for 3 min. The supernatant was discarded, and from the deposit, saline and iodine mounts were prepared and examined for the presence of intestinal parasites. The frequency data were analysed using Chi-square (χ2) while the risk factors were calculated using odds ratio. The statistical software used for the analyses was INSTAT® (GraphPAD Software Inc., La Jolla, CA, USA). A total of 37 (30.8%) out of 120 masons had intestinal parasitic infection. The age group of 21–25 years had the highest prevalence (38.9%) of intestinal parasitic infection amongst masons when compared with other age groups. However, age did not significantly affect the prevalence of intestinal parasitic infections amongst cement masons (P = 0.7695). Marital status, educational status, source of water and source of food did not strongly associate with the prevalence of intestinal parasitic infection amongst masons (P > 0.05). Length of service of masons significantly associated with the prevalence of intestinal parasitic infection (χ2= 36.510; P < 0.0001) with those who have worked for over 30 years having the highest prevalence (85.7%) of intestinal parasitic infections [Table 1]. The intestinal parasites recovered in this study were A. lumbricoides, Strongyloides stercoralis, T. trichiura, hookworm and Entamoeba histolytica. A. lumbricoides was the most prevalent (73%) intestinal parasite observed amongst masons [Table 2]. Intestinal parasites are amongst the most common of all chronic human infections, occurring predominantly in areas of poverty and inadequate hygiene and sanitation in the developing world. The prevalence of intestinal parasites has been studied in some populations mostly children,,, HIV-infected patients, and artisans all in Benin City. Data are lacking on the prevalence of intestinal parasitic infection amongst masons in Benin City, Edo State. Thus, this study was conducted to determine the prevalence of enteric parasitic infection amongst masons in Benin City, Edo State. Patterns of intestinal parasitic infections in the population may be altered on account of changes in man behaviour and lifestyles during a time and prevalence of these varies with different geographical regions.,, An overall prevalence of 30.8% of intestinal parasitic infection was observed amongst masons in this study. The prevalence observed in this study was higher than the 5.3% observed amongst HIV-infected patients in Benin City and 10.06% reported amongst patients in Iran. The difference in the prevalence may be due to the type of study population used. The study of Akinbo and Omoregie used HIV-infected patients on highly active retroviral therapy; Zebardast et al. used gastrointestinal disorder patients while we used cement masons. Masons are likely to have frequent contact with contaminated sand carrying the infective forms of intestinal parasites while working on sites. This may explain the finding in this study. Age, marital status, educational status, source of water and source of food did not significantly associate with the prevalence of intestinal parasitic infections. The length of years of work significantly associated with the prevalence of intestinal parasitic infections as those who have worked 30 years and above had the highest prevalence (85.7%) of intestinal parasitic infections. Masons frequently come in contact with the infective forms of these parasites in contaminated soil in the course of using sand for mortaring as the ova of A. lumbricoides can survive in the soil for prolonged periods as much as 10 years, up to 2 years for infective larva of hookworm and several weeks for the cysts of E. histolytica. Prolonged contact with contaminated soil may be responsible for this finding amongst masons. An overall prevalence of 30.8% of intestinal parasitic infection was observed amongst masons in Benin City. Length of years of work significantly affected the prevalence of intestinal parasitic infection amongst masons. A. lumbricoides, S. stercoralis, T. trichiura, hookworm and E. histolytica were the intestinal parasites observed, whereas A. lumbricoides was the most prevalent of all the intestinal parasites recovered amongst masons. Measures to reduce the prevalence of enteric parasitic infections and its associated sequelae are advocated. We acknowledge the participants who participated in this study. Arani AS, Alaghehbandan R, Akhlaghi L, Shahi M, Lari AR. Prevalence of intestinal parasites in a population in South of Tehran, Iran. Rev Inst Med Trop Sao Paulo 2008;50:145-9. Jean T, Thomas F, Kigbafon D, Stefaire K, Dimitri H, Mamadon O, et al. 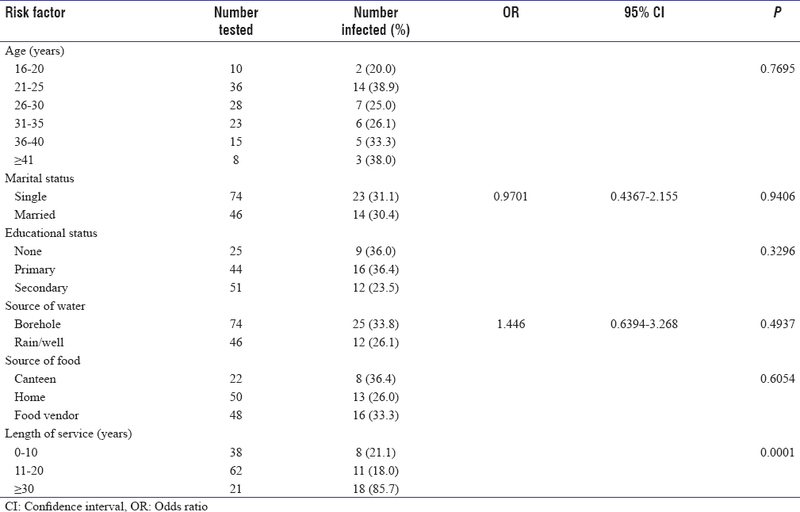 Intestinal parasitic infections in school children in different settings of Cote d'ivoire: Effect of diagnostic approach and implications for control. Parasit Vectors 2012;5:135-45.
WHO. Accelerating Work to Overcome the Global Impact of Neglected Tropical Diseases. A Roadmap for Implementation. Geneva: WHO; 2012. p. 37. Harhay MO, Horton J, Olliaro PL. Epidemiology and control of human gastrointestinal parasites in children. Expert Rev Anti Infect Ther 2010;8:219-34.
de Silva NR, Brooker S, Hotez PJ, Montresor A, Engels D, Savioli L. Soil-transmitted helminth infections: Updating the global picture. Trends Parasitol 2003;19:547-51. Mehraj V, Hatcher J, Akhtar S, Rafique G, Beg MA. Prevalence and factors associated with intestinal parasitic infection among children in an urban slum of Karachi. PLoS One 2008;3:e3680. CDC. Parasites. Available from: http://www.cdc.gov/parasites/. [Last accessed on 2016 Aug 03]. Jia TW, Melville S, Utzinger J, King CH, Zhou XN. Soil-transmitted helminth reinfection after drug treatment: A systematic review and meta-analysis. PLoS Negl Trop Dis 2012;6:e1621. Pullan RL, Brooker SJ. The global limits and population at risk of soil-transmitted helminth infections in 2010. Parasit Vectors 2012;5:81. Brooker S, Clements AC, Bundy DA. Global epidemiology, ecology and control of soil-transmitted helminth infections. Adv Parasitol 2006;62:221-61. Hotez PJ, Kamath A. Neglected tropical diseases in Sub-Saharan Africa: Review of their prevalence, distribution, and disease burden. PLoS Negl Trop Dis 2009;3:e412. Ignatius R, Gahutu JB, Klotz C, Steininger C, Shyirambere C, Lyng M, et al. High prevalence of Giardia duodenalis assemblage B infection and association with underweight in Rwandan children. PLoS Negl Trop Dis 2012;6:e1677. Tefera E, Mohammed J, Mitiku H. Intestinal helminthic infections among elementary students of Babile town, eastern Ethiopia. Pan Afr Med J 2015;20:50. Mata L. Sociocultural factors in the control and prevention of parasitic diseases. Rev Infect Dis 1982;4:871-9. Cheesbrough M. Parasitological tests. In: District Laboratory Practice in Tropical Countries. Cambridge: Cambridge University Press; 1999. Brooker S, Bundy DA. Soil-transmitted helminths (geohelminths). In: Edneds Cook GC, Zumla A, editors. Manson's Tropical Medicine. 22nd ed. London: Elsevier Health Sciences; 2009. Nwaneri DU, Ibadin MO, Ofovwe GE, Sadoh AE. Intestinal helminthiasis in children with chronic neurological disorders in Benin City, Nigeria: Intensity and behavioral risk factors. World J Pediatr 2013;9:152-7. Nwaneri DU, Omuemu VO. Intestinal helminthiasis and nutritional status of children living in orphanages in Benin City, Nigeria. Niger J Clin Pract 2013;16:243-8. Akinbo FO, Asein OK, Okaka CE. Intestinal parasitic infections in primary school children in rural communities in Edo State, Nigeria. Ann Biomed Sci 2014;13:74-82. Akinbo FO, Okaka CE, Omoregie R. Prevalence of intestinal parasitic infections among HIV patients in Benin City, Nigeria. Libyan J Med 2010;5:5506. Akinbo FO, Okaka CE, Omoregie R. Seasonal variation of intestinal parasitic infections among HIV-positive patients in Benin City, Nigeria. Ethiop J Health Sci 2011;21:191-4. Akinbo FO, Ikedje A, Okaka CE. Intestinal parasitic infections among artisans in Benin City, Nigeria. Niger J Clin Basic Sci 2013;10:66-9. Kia EB, Hosseini M, Nilforoushan MR, Meamar AR, Rezaeian M. Study of intestinal protozoan parasites in rural inhabitants of Mazandaran province, Northern Iran. Iran J Parasitol 2008;3:21-5. Ramana KV. Intestinal parasitic infections: An overview. Ann Trop Med Public Health2012;5:279-81. Akinbo FO, Omoregie R. Intestinal parasitic infections in HIV-infected persons on highly active antiretroviral therapy (HAART) in Benin City, Edo State, Nigeria. Genomic Med Biomark Health Sci 2012;3:119-22. Zebardast N, Gharavi MJ, Abadi A, Tabaei SJ, Yeganeh F, Khazan H, et al. Frequency of intestinal parasites in patients with gastrointestinal disorders in different parts of Iran during 2012-2013. Int J Enteric Pathog 2015;3:e22682. Khuroo MS. Ascariasis. Gastroenterol Clin North Am 1996;25:553-77. Cheesbrough M. Parasitological tests. In: District Laboratory Practice in Tropical Countries. Part 1. 2nd ed. Cambridge; Cambridge University Press; 2005. Nduka FO, Nwaugo VO, Nwachukwu NC. Human intestinal parasite infections in Ishiagu, a leading mining area of Abia State. Anim Res Int 2006;3:505-7. Ajayi MB, Gbadeyan MS, Avwioro GO, Idowu ET, Adedire AO. A study of intestinal helminthes in patients in Lagos University Teaching Hospital, Nigeria. Int JAdv Biosci 2013;1:24-7.